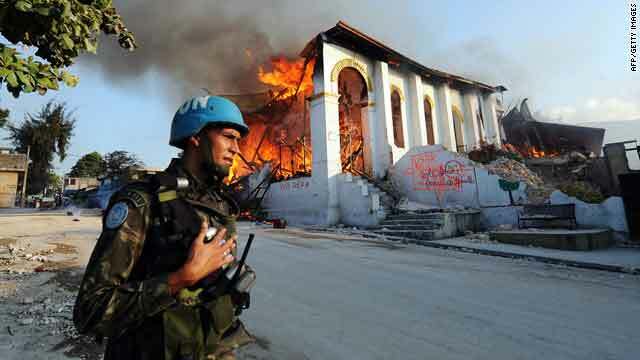 A Brazilian U.N. soldier secures the area around a church that burned Tuesday after collapsing during last week's earthquake. Ban Ki-moon asks other relief groups to coordinate with U.N.
United Nations (CNN) -- The United Nations Security Council has approved a proposal to send an additional 2,000 soldiers and 1,500 police officers to quake-ravaged Haiti, U.N. Secretary-General Ban Ki-moon said Tuesday. By its approval of the plan Monday, "the council sends a clear signal: The world is with Haiti," Ban said. He said he was confident that member states would respond quickly in order to get the troops on the ground as soon as possible. "I believe that the deployment of additional troops and police forces will be done quite quickly," Ban said. "... 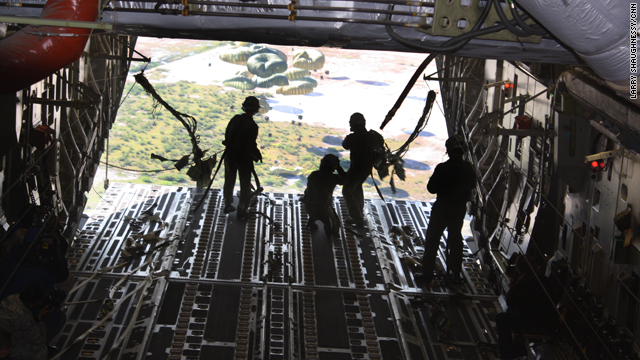 In every aspect of our operation there, we are running against time." The forces will bolster the approximately 7,000 U.N. soldiers and 2,200 police already assigned there, at least 22 of whom were killed in the January 12 earthquake. About 150 people affiliated with the U.N. remain unaccounted for. Although Tuesday marks a week since the magnitude 7.0 temblor struck, "there are still lives to be saved," Ban said. Some 90 victims have been saved by 43 international rescue teams, made up of about 1,700 people. Relief operations and delivery of aid are increasing and becoming better organized, Ban said, although he added, "For those who have lost everything, of course, help cannot come soon enough." Despite logistical challenges, the situation is improving, he said. New corridors have been cleared on land. Capacity at Port-au-Prince's airport is improving. And a main port -- rendered unusable by earthquake damage -- is expected to be reopened next week. "There have been some difficulties and some bottlenecks in delivering our relief items," Ban said. "... The situation is overwhelming." But U.N. personnel are working day and night to overcome hurdles and increase the delivery of aid to Haitians, he said. "On the ground, we have seen some difficulties when it comes to deliver[ing] actual relief items, because of the over-demand and the extraordinary situation. I have seen for myself how many people are without homes and shelters, and we have to work very hard, according to this cluster system," Ban said. He was referring to the U.N. Cluster System set up for disasters, under which the World Health Organization plays a lead coordinating role for health, the U.N. High Commissioner for Refugees or the Red Cross for shelter, and the World Food Programme for food. Twelve cluster systems are up and functioning, Ban said Tuesday, "so you will see a much improved situation in terms of coordination, in terms of delivering aid to people who need it." On Monday, daily food rations for 200,000 people were distributed. The World Food Programme's goal is to reach 1 million people within a week and 2 million within two weeks, he said. "Our chief priority right now is to get the relief distribution system in Port-au-Prince fully operational so that we may more efficiently distribute supplies -- food, water, medicine, tents and other essential items," Ban said. Ban appealed to international nongovernmental organizations and aid groups to work closely with the U.N. in delivering aid. "We are concerned ... that numbers of unsolicited and uncoordinated supplies and personnel entering the country will stretch limited logistical resources and interfere with the delivery of vital aid," he said. "We have already turned our attention to outlying regions, as well as the capital city. As you know, in certain areas, such as Leogane, the situation is every bit as critical, if not more so, than in Port-au-Prince." Asked about a report that fuel for U.N. trucks was scarce, Ban said 10,000 gallons of fuel arrived from the Dominican Republic on Monday night. Alain Le Roy, U.N. peacekeeping director, was asked about reports of looting. It is occurring, Le Roy said, but is not widespread. "Of course there is looting, but there has been looting in the country for many, many years, even before the earthquake," he said.